After fire, Wise Sons new bagel venture up in the air – J. When a fire claims one life, leaves dozens homeless and causes a reported $8.5 million in damage, it’s hard to shed a tear over a deli not being able to launch its bagel business. But because I write about the Jewish food scene in the Bay Area, I need to report on the big doings Wise Sons Jewish Delicatessen was up to when its Mission District production kitchen and bakery was ravaged in a four-alarm fire on Jan. 28. For weeks, Wise Sons’ bakers had been quietly testing and perfecting bagels: plain, everything, sesame seed and salt. A 12-foot-long bagel machine that could spit out thousands of raw bagels a day had been purchased, and a process that included 36 hours of proofing, boiling the bagels in water laced with malt syrup and then baking them in a huge, wheel-in rack oven was in place and ready to go. All of this was to occur in the facility at 22nd and Mission streets. The new venture had been tabbed Wise Sons Bagel, with a logo designed by co-owner Evan Bloom and his girlfriend, Jessica Choi — a fun drawing of a man with a long beard, hat and tallit riding a fish cowboy-style, with one hand on the reins and the other in the air clutching a bagel “yee-haw” style. An unpublicized soft launch was set for the morning of Jan. 29, and to help get the word out, Wise Sons was to drop off hundreds of bagels at businesses such as Twitter and Zynga. The fire started about 14 hours before all that was supposed to happen. A major “public reveal,” in Bloom’s words, was set for Feb. 3; it was to include more than 1,000 preordered bagels distributed via a delivery service. Moreover — and this is my favorite part — Wise Sons was going to set up a handful of bagel outposts around the city, small storefronts that would need a toaster, a coffee machine and not much more. Centrally produced bagels would be delivered hot and fresh every morning. Everything will still happen at some point, but it’s all up in the air for now. Bloom and co-owner Leo Beckerman salvaged their bagel machine, but it requires three-phase electric power and, as of Feb. 10, they hadn’t been able to plug it in anywhere to test it. And because the 22nd and Mission location is still off limits, they haven’t been able to check out the status of their huge oven. For the time being, Wise Sons is getting its rye from Max’s, about 250 bagels per week from Beauty’s Bagel Shop in Oakland and assorted pastries from various locations. KOSHER NO MORE: When Laura Athuil opened Choux six months ago, she had decided to operate her patisserie under strict kosher guidelines. As time went on, however, she changed her mind, so as of Jan. 30, the specialty French cream puff bakery in San Francisco’s Lower Haight is no longer kosher. Athuil, a member of the Chabad of North Beach community who hails from Nice, France, said there were two reasons for giving up the certification from Vaad Hakashrus of Northern California. Athuil said there has been no backlash from customers, who knew from the outset that Choux wasn’t a “kosher bakery” but rather a French bakery that happened to be kosher. She said people thanked her for trying and acknowledged how difficult it is to operate as a kosher business. FLYING INTO S.F. : A Jewish food vendor who worked at Israel in the Gardens from 2007 to 2012 has opened his first brick-and-mortar restaurant. It’s not far from where he used to serve hundreds of hungry festivalgoers at Yerba Buena Gardens. Assaf Pashut, who was born and raised in Karmiel in northern Israel, opened the Flying Falafel on Market Street (between Sixth and Seventh streets) in late January, in a tiny spot that formerly sold baked french fries. “It’s been a long journey to get here, so I’m really happy the day is here,” said Pashut. He started the operation eight years ago during his senior year at U.C. Berkeley, cooking up falafel for his fellow students as part of a school project. Eschewing his neuroscience major, he opted to make a go of it with a catering business, and the Flying Falafel found its niche at farmers markets, street fairs and outside businesses, mostly in the South Bay. The new restaurant serves a traditional falafel sandwich for $7, plus some creatively named items such as a “Hummus Saucer” ($5) and a “Falafel Frisbee” with 10 falafel balls ($10). There are also sides and a banana milkshake, and the whole menu is vegan (but not kosher). 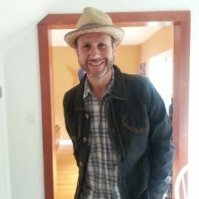 Pashut told SF.Eater.com that he’s already looking for a second location in the South Bay.